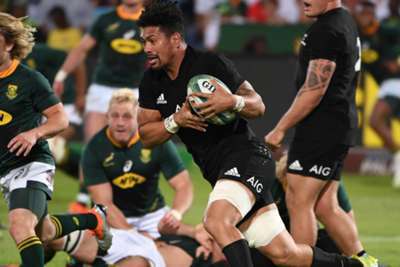 All Blacks and Hurricanes flanker Ardie Savea recommitted to New Zealand Rugby (NZR) until at least the end of 2021. Savea, 25, has made 35 Test appearances for the All Blacks, including 13 this year. Ahead of next year's Rugby World Cup, Savea re-signed with NZR, much to the delight of outgoing head coach Steve Hansen. "We're delighted that Ardie has re-signed for two more years. He's an outstanding player who had a huge workload for the All Blacks in 2018," he said. "We look forward to seeing him in action again in 2019 and beyond." The All Blacks will go into next year's tournament as one of the favourites and face South Africa, Italy, Namibia and Canada in Pool B.
Hurricanes coach John Plumtree was also thrilled to keep Savea. "While Ardie is only 25 he has played a lot of Super Rugby and is a natural leader within our squad and in our club," he said. "We've all seen the great form he has been in, especially near the end of the international season, and the discussions I've had with Ardie since he has been back have made it clear he wants to maintain that with the Hurricanes."